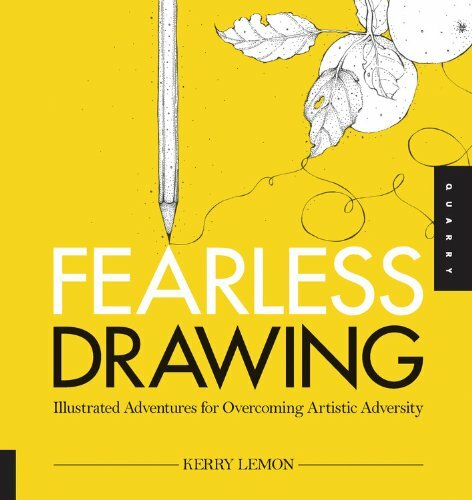 Fearless Drawing is an activity book for beginners, those who might want to try different ways to approach drawing, or those who don't draw at all and just want to have something fun to do. The author is Kerry Lemon from England. The drawing tasks are quite elementary. Just to give you an idea, the first task starts with acquainting with a pencil, finding different ways to hold it, experimenting with pressure and speed when drawing lines, trying different shading styles. The second task is about the eraser, and you get to shade a whole piece of paper, when use the eraser to clean up a portion for drawing, in this case a fruit. There are also non-drawing tasks, such as cutting out shapes, drawing with wires, stitching your paper, and more. The tasks are more on enjoying the process, doing something you normally won't. The instructions are clear and simple to follow. The book is probably more for the younger crowd. It's a nice book for children to keep them busy productively.